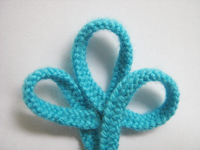 I found a site with a cute Kumihimo flower hair pin that is made from a beautiful Japanese knot. On the photo you can see my Kumihimo cord which I want to use to make such a Kumihimo flower but the cord isn’t finished, yet. I think that I will embellish it later with some beads because the single-coloured cord will possibly look bland.